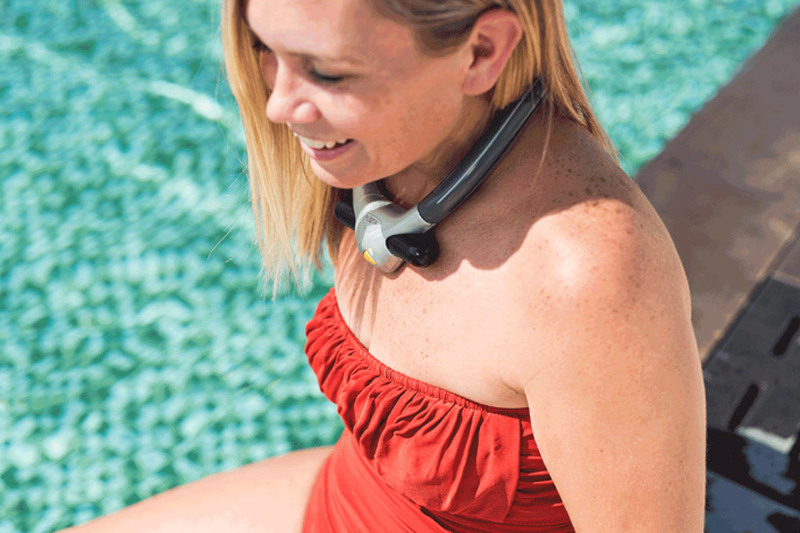 the ploota is a sensor controlled swimming safety device that sits around your neck. both compact and reusable, unlike most life-jackets the ploota can be worn underwater. 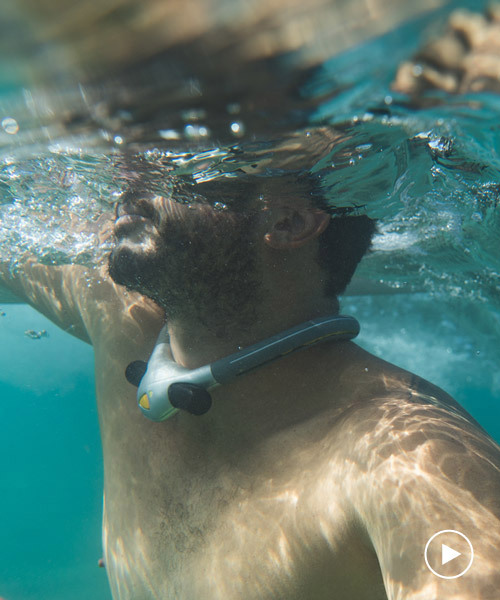 swimming, snorkeling or deep sea diving, the device can be triggered when you need to be brought back up to the surface. 1/50th the size of a regular foam-based life jacket, the ploota is compact, taking up 50 times less space than average life-jackets. another remarkable feature is that the device is extremely lightweight, weighing only 280gms and allowing users to engage in high-intensity water sports. when it inflates refillable-CO2 cartridges in the front are engaged, inflating two bags on the side and above the shoulder immediately, bringing you to the surface of the water. When will the life jacket be available? Great design for an upgrade of a much used item. 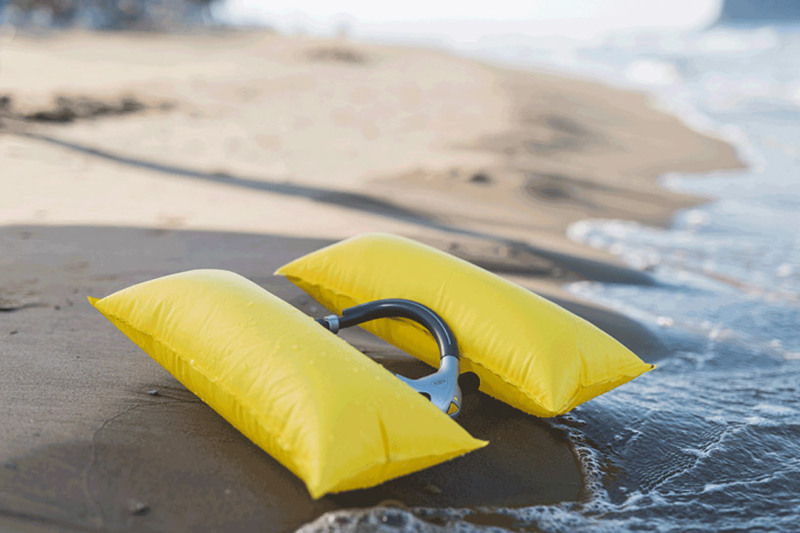 Life jackets stop people from drowning. I cannot see this product doing that! + you need to be conscious to activate it so… not so secure to me ! Unless you walk around with this -not-practical-as-a-life-jacket-can-be- inflated thing around your neck…. @Fi: I do – watch the video!? But it can’t be called a “life jacket” as it isn’t a jacket, it’s a collar. It looks a lot better than nothing, but the head/mouth seems to stay pretty close to the surface, so with little waves or more weight it will be harder to breathe. But if it is also easy to put on in case of panic, that’s good. The activation instead seems to require a certain hand force on the right spot (not the left one…) and isn’t really intuitive like somehow tugging on a rope with a handle. It’s an interesting and novel idea, but they REALLY shouldn’t call it a ‘Lifejacket’, as it’s NOT one. Like there is a difference between a ‘Lifejacket’ (HAS to auto-inflate, with a minimum 150N buoyancy and HAS to right you and lift your airway out of the water), and a ‘Buoyancy Aid’ (Foam vest) which only has to be 50N buoyancy and won’t help if you’re unconscious. Even more so with ‘Impact Vests’ for Wake Boarding or Kite Surfing which provide even less buoyancy, but are more for impact protection.